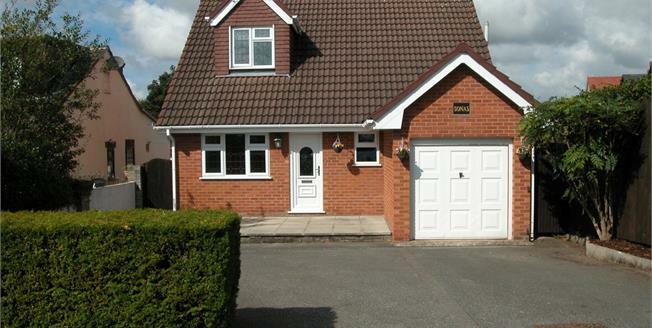 Constructed in about 1997, this most impressive detached property offers deceptively spacious internal accommodation. On the ground floor is an impressive reception hall, with cloakroom/w.c. off. The lounge to the rear opens through to a double glazed conservatory, which overlooks the large rear garden. The spacious kitchen has recently been re fitted, and there is a separate sitting room on the ground, which could be used as a fourth bedroom. Upstairs are three further bedrooms and a re fitted bathroom. Upvc double glazing is installed and there is a gas fired central heating system. There is excellent off road parking to the front, and an integral garage. The centre of Neston is within an easy walk, with its wide range of amenities. Early possession is possible, as the property benefits from no onward chain. RECEPTION HALL with double glazed front door and window, radiator and stairs to first floor. CLOAKS/W.C./UTILITY ROOM with low level w.c., wash basin, part tiled walls, radiator/radiator screen, appliance spaces and double glazed window to side. CONSERVATORY 12' 0" x 10' 0" (3.66m x 3.05m) upvc double glazed conservatory overlooking the rear garden with electric heater, french door to outside. KITCHEN/BREAKFAST ROOM 13' 6" x 11' 6" (4.11m x 3.51m) beautifully re fitted with a range of cream fronted units comprising 1.5 bowl sink unit in base unit, further range of base units with cupboards and drawers, good range of contrasting work surfaces with tiled splashbacks, range of wall cupboards, electric four ring hob with cooker hood over, built in oven, built in fridge and freezer, radiator, double glazed door and window to rear. SITTING ROOM/BEDROOM 4 13' 4" x 8' 6" (4.06m x 2.59m) double glazed window to front and radiator. BEDROOM 1 13' 3" x 10' 2" (4.04m x 3.1m) including built in wardrobe, radiator and double glazed window to rear. BEDROOM 2 11' 4" x 10' 2" (3.45m x 3.1m) including built in wardrobe, radiator and double glazed window to rear. BEDROOM 3 10' 0" x 9' 2" (3.05m x 2.79m) the measurement excludes built in wardrobe. Radiator and double glazed window to front. BATHROOM beautifully refitted with a white contemporary style suite comprising panelled bath, shower above, glazed shower screen, vanity unit, low level w.c. chrome radiator/towel rail, ceramic tiled walls and double glazed window. INTEGRAL GARAGE 16' 2" x 8' 5" (4.93m x 2.57m) with up and over door, gas central heating boiler. The majority of the gardens are to the rear, and are predominantly laid to lawn, with raised decking area, patio, and a garden shed. There is mature hedging offering a good degree of privacy, and a sunny aspect.